The first smartphones with foldable displays are coming to market in just a few months, and there’s no telling which way the wind will blow. Will the Samsung Galaxy Fold‘s inward folding display capture the hearts of consumers, or will the Huawei Mate X’s outward folding display win the day? Motorola seems to be taking a different approach to the foldable as the company is said to be bringing back their iconic Razr brand with a vertically folding display. In my previous article, I detailed some software features of Motorola’s upcoming dual-display foldable smartphone. Now, I have obtained information from a source that confirms the Razr branding and details much of the specifications. The feature image above shows the new logo that Motorola has designed for the return of its Razr brand. To protect our source, I lifted the logo from the original image and added a plain black background. The logo belongs to the “Voyager” device that I revealed in my previous article and confirms that a Motorola Razr branded product is in the making. However, we don’t know if the phone’s full marketing name will be the “Motorola Razr,” “Moto Razr,” or something else with “Razr” in the title. We’re confident the phone is launching on Verizon, so it’s possible that Verizon will have some influence on the marketing name for its version of the device. According to the information that we obtained, the Motorola Razr will be powered by the Qualcomm Snapdragon 710 mobile platform. The Snapdragon 710 has 8 CPU cores built on Qualcomm’s customized Kryo 360 architecture (2x ARM Cortex-A75-derived at 2.2GHz and 6x ARM Cortex-A55-derived at 1.7GHz). The GPU is Qualcomm’s Adreno 616. Although the chipset offers support for Qualcomm Quick Charge 4+, we don’t know what kind of fast charging the Motorola Razr will offer. I’m speculating that the foldable smartphone will support Motorola’s 27W TurboPower charging like the Motorola Moto G7 Plus. We know of two RAM and storage variants so far, but we don’t know which one Verizon will carry. The Motorola Razr will come with 4 or 6GB RAM and 64 or 128GB storage. The battery capacity is said to be 2,730mAh, though the information we have on the battery may be outdated. The battery is a lot smaller than the batteries found in other foldables, but the Motorola Razr is also a smaller device than the Huawei Mate X or Samsung Galaxy Fold which both manage to fit two batteries in each half. We’re still gathering information on the Motorola Razr’s camera, and we’ll update this article if we learn more details. The primary display for “Voyager” is likely a 6.20-inch 876×2142 resolution display, likely OLED given its foldable nature. The “closed” or secondary display has a resolution of 600×800, though we don’t know its dimensions. Lastly, we know of three different colors for the device: white, black, and gold. However, we don’t know how much each model will cost, which one(s) Verizon will carry, or whether there’s a RAM/storage discrepancy between the colors. To recap, here’s what we think we know so far about “Voyager,” the first foldable phone in the new Motorola Razr line. 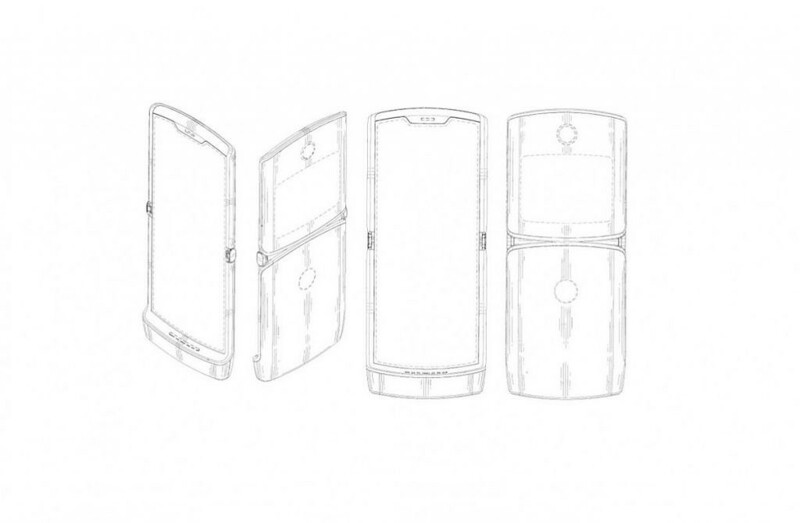 If you’re wondering what the device will look like, we think the images that Motorola shared with the World Intellectual Property Organization are accurate. The images show a phone that has a vertically folding display accompanied by a secondary display on the exterior. We think that Motorola will use the external display for certain camera controls, as a trackpad for Google Chrome, and to provide limited access to Quick Settings tiles, Google Assistant, the clock app, notifications, and media controls. There appears to be a single rear-facing camera and rear-mounted fingerprint scanner in the images, but we can’t corroborate the camera count or information on the fingerprint scanner. We don’t have any information to share about the Motorola Razr’s pricing or availability. The Wall Street Journal reported that the phone will start at $1,500. That’s several hundred dollars cheaper than the Samsung Galaxy Fold or Huawei Mate X, but what we know so far about the Motorola Razr’s specifications point to a smartphone with considerably less powerful internals than the other foldables. Motorola could still surprise us with the design and camera, though, so we’ll refrain from passing judgment on the Razr until we have more concrete details. This article was updated on 3/12/19 at 11:37AM ET to correct the GPU from Adreno 615 to Adreno 616. The article was also updated to clarify that we don’t know the fast charging tech employed in the Razr.